Looking for a quick weekend adventure, without shelling big bucks? Then The Goan Corner guest house in Hampi is where you should stay. Situated across the river on the Anegundi side, lost in the middle of lush, green rice fields, this relaxing guest house welcomes travellers from all over the world. On the other side, just a short walk away lies the majestic Tungabhadra river. 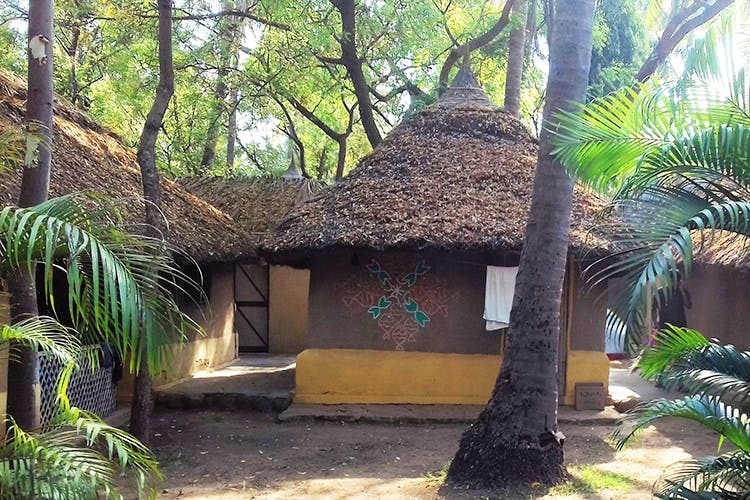 Made up of simple, clean huts with a hammock outside for just INR 700 a night, The Goan Corner also offers a restaurant with an international menu and free yoga lessons each morning. And if you are looking at even cheaper accommodation, then there is the dorm (at INR 200 only), which is basically comfortable mattresses, covered by a mosquito net, laid out on the terrace of the guesthouse. The rooms are pretty basic and come with an attached or non-attached bathroom and private hammock. Beer is served in the guest house, which means you can park yourself in the common area that comes with floor level seating, and exchange plenty of conversation with fellow travellers. Because it is Hampi and it is so hot between 10am to 6pm, we’d say wake up early and go for a walk to catch a brilliant sunrise at the statuesque Matunga Hill Temple, famous for being the highest point of the town. After this, you got to wind down with a delicious meal! The Ganesh Rooftop Restaurant is probably one of the cheapest (INR 150 per person only) and most welcoming. No matter where you come from, you will probably arrive in Hospet. Bangaloreans, the easiest way to get here is by an overnight bus (from Majestic). Then you could take a rickshaw or a bus to reach Hampi. You will have to cross the river to go across the other side, walk up the embankment and then it is just a 5-minute walk across the rice fields to reach The Goan Corner. The guest house is always packed, so you will need to book your stay much in advance. But in case you arrive on short notice, there is always the terrace dorm.